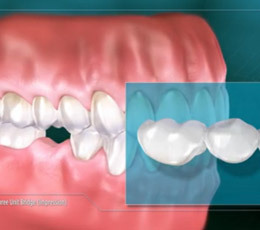 There are several types of bridges and we will discuss the best option for your particular case. The "traditional bridge" is the most popular type and is usually made of porcelain with a metal substructure for strength. You do not see the metal so the bridge looks like natural teeth. The missing tooth is replaced by an artificial tooth, or pontic, that is attached to the adjacent anchor teeth, or abutments. Dental bridges are highly durable and will last many years, however they may need replacement during your lifetime. Getting a bridge usually requires two or more visits. While the teeth are numb, the two anchoring teeth are prepared for crowns. Highly accurate molds (impressions) and other records are taken that are sent to a local dental laboratory (we have one on site). We then fabricate and cement a temporary restoration in place that is worn while the laboratory technician fabricates your new bridge. The second appointment follows about two and a half weeks later. The temporary restoration is removed and the permanent bridge is carefully tried in and adjusted to ensure proper fit. We then cement the bridge permanently and show you how to properly care for your new permanent tooth replacement. Remember that proper brushing, flossing and regular recall visits are important to ensure the health and longevity of your new restoration.